@Alexandra | Get Your Grub On! Breaking News: Zhong Guo opens 2nd outlet! 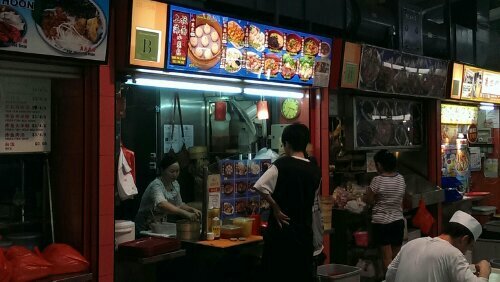 People living around Bukit Merah can consider themselves lucky as ‘Zhong Guo‘ just opened a new outlet at Bukit Merah Food Center. The menu is the same as the one at the Chinatown Complex Food Center outlet so it’s still all about noodles and dumplings. Enjoy, enjoy! After a nice sunny day at the beach we were craving some juicy burgers from and made a little detour ‘De Burg’ in Bukit Merah before heading home. Business was already going well which pushed the waiting time up to thirty minutes but being in Asia for some time now I don’t really mind waiting if it’s for some great grub. I ordered the ‘Singhjector‘ which was next in line of my to try burgers even that it was quite difficult for me not to have their fantastic ‘Choco Lamb‘ burger again. The ‘Singhjector‘ truly was pork galore with a super juicy and well seasoned pork patty, some wonderful crispy and salty Canadian bacon and Iberico chorizo which I couldn’t really work out from all the other ingredients. The smoky cheese and the sweet bbq sauce gave it all a nice finish and the only thing I missed was maybe a little bit of lettuce. 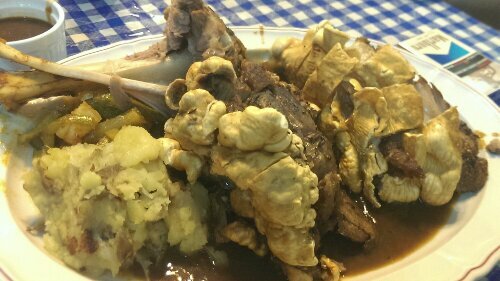 At the same time my friend had ordered a ‘Pork Knuckle‘ from neighboring ‘Stew Küche‘ – from which I took some crackling and slipped it into my burger. The birth of the ‘Singhjector – Heart Attack Edition‘. If you like pork, this is your burger; juicy, salty goodness with great quality ingredients. It didn’t really need any modifications but when I saw my three pork ingredients burger next to the pork knuckle it just came naturally. Thanks again for keeping up a constant high level of quality burgers. Still the best on the island I reckon. Finally some errands brought me back to Queensway and as it was so conveniently located I decided to return to ‘De Burg’ to finally try that mystical ‘Choco Lamb Burger‘ which I couldn’t get out of my head since I first saw it on the menu. To be honest until I had my first bite I was not really sure if this was going to be totally disgusting or weirdly good. For a while I looked at the mayonaise and Nutella with slight disbelief but finally my curiosity won and I anxiously took a big mouthful. Now this was absolutely amazing. It worked so much better together than I ever would have thought. At first it felt like biting into a toasted Nutella roll from my childhood until I tasted that delicious lamb patty and it transformed into a burger. The meat was nicely charred on the outside but juicy and full of flavour on the inside, not too lamby as well. The juices and the chocolate mixing was a real eye opener. I couldn’t believe how fantastic that actually came together and that no one (at least that I know) has ever tried this before. The only ingredient that I reckoned was a bit odd was the tomato. The whole burger disappeared in no time and left me nicely filled and super content. I was really happy I gave this burger a shot and can’t wait to introduce it to friends but thanks to the guys from ‘De Burg’ I already have another newly introduced burger lined up that wants to be “grubbed on”- ‘The Singhjector‘. Well done guys, you made my day. It was the last day in the office for one of my colleagues and since we always wanted but never managed to all go together to ‘De Burg’ one other colleague who actually had a day off kindly went and got us all a nice takeout lunch. I often told my colleagues about this place and how nice their burgers are so everybody had pretty high expectations which is why I was a bit concerned as I never tried to takeaway. 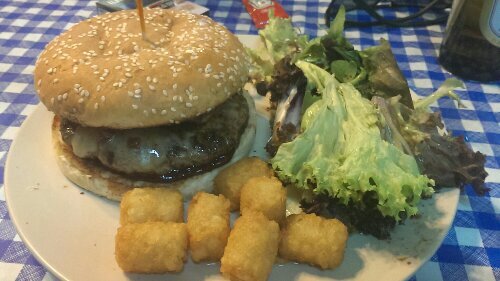 We all ordered the same classic 200gr ‘Bacon Cheese Burger‘ with ‘Tater Tots‘. I knew the burgers are good but I was surprised how good they still were after a 30 minute car ride. The beef, which they ground themselves was perfectly medium well, still juicy and with a natural and strong beef taste too it. One of my favorite bits was the bacon which was nice and salty and super crispy, not too much, just right. BACON! 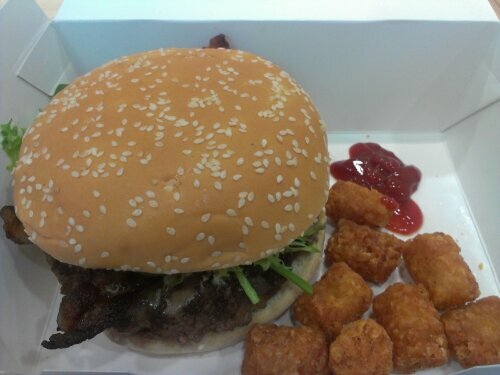 The bun was fluffy and held up properly not making eating this huge burger a huge mess and even the ‘Tater Tots‘ were still crunchy and potaolicious. I’m not sure how they did it but even takeaway this is still my favorite burger in town after trying loads and loads. 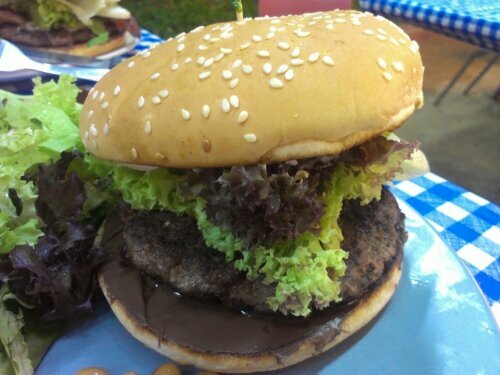 I hope my motorbike needs servicing again soon so I can come back to Bukit Merah to finally try their ‘Choco Lamb Burger‘. Burgasm approaching.